Workshop and Workplaces For the Historic Engine Co Late Summer. 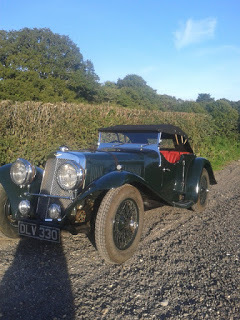 This Wonderfully original, 23,000 miles Derby Bentley has been in the family for decades. Here being surveyed at Fiennes Restoration. Everyone is keeping fingers crossed that they might see this car back on the road.. Treasures waiting outside of my own home workshop. You may have seen the Delage a little while ago. We decided it prudent to see if we could fit a modern oil filter to the engine as it had been built but not run in te late 60's. I am glad we did, this is the second filter in a few hours of running, Mostly this is white metal machining swarf. We elected to partially strip and clean the engine and crank oilways. I think this is one of the nicest natural, mature slightly worn cars I have ever worked on. The owner has looked after her fastidiously over the many years of growing up children, grand children and family dogs, this Triumph is near perfect inside and out. She had a bit of a "refit" (the owner is a maritine man) in the 80's using all new Triumph parts.. amazing condition. We have been attending to the head gasket and a number of other items prudent at this time, including a new radiator and electric fan. Not the Triumph now: The photo below shows that if you have the opportunity, check machined parts and new parts as the "buck stops" with the engine builder. There is about 30% contact when blued in this recut seat. In this case there were other issues too ..... I actually don't know who did the machine work as this is how it arrived, I am pleased to have removed the valves. Jacob gains a wealth of experience when he is working at Fiennes Restoration .... the place that started it all for me! As you will see in older posts, I have a childhood interest in modelling and slot cars and American Oval racing. builders that I regularly work with, had me wondering ..... a copper body slot car, Sprint racer! This is a WIP and has been for most of the year but it is coming to shape. You might be interested in the models of Gerald Wingrove, his books always topped my school holiday library book list. This model is 1/32 Scale, about 4" long (100 mm).